It finally happened! After less than a year of yachts, beach vacations, and premieres of The Intern, Mariah Carey and That Billionaire have gotten engaged! Though I like imagining Mariah doing the asking, E! reports it was James who got down on one knee. 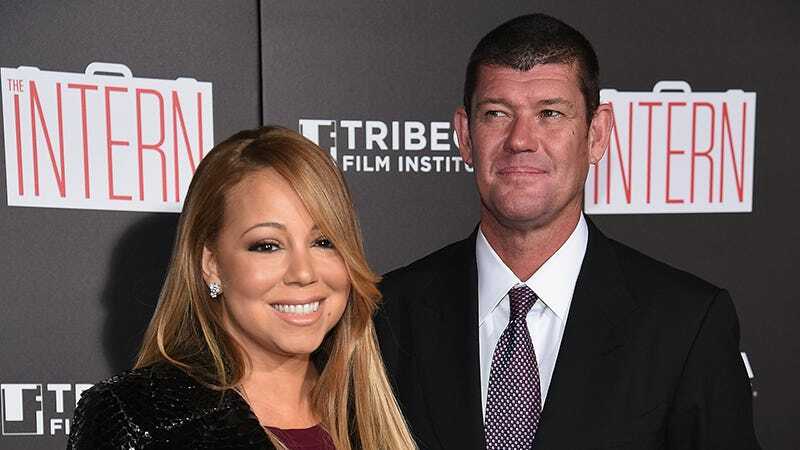 Mariah’s future hubby popped the big question in her hometown tonight, and he presented her with what can only be described as the most breathtaking engagement ring. We’re told that Mariah’s new diamond bling comes in at around 35 carats and that no wedding date has been set just yet. When saving the photo above, I named it LOVE.jpg because there is no other word to describe it. Radar is reporting Denise Richards has filed a lawsuit against Charlie Sheen, accusing him of “taking money out of a trust for their daughters, Sam, 11, and Lola, 10, in order to fund his party lifestyle.” I assume the lawsuit doesn’t contain the phrase “party lifestyle,” but who knows! The lawsuit accuses Sheen, 50, of selling a Mulholland Estates mansion that was put in a trust for their daughters, and not turning returning the money to the trust after it was sold. The house was supposed to give them financial security for the future, according to insiders. Sheen is the only defendant in the suit. Richards reportedly wants a judge “to force Sheen to pay for a new home.” I would like to force a judge to keep this saga from getting any more depressing. Kate Hudson had her stylist post this naked photo of her to lure Nick Jonas into her web? Contact the author at bobby@jezebel.com.